The yurt, yellowish in color, is way up yonder in the mountains. Yipes, there is an outhouse about 20 yards away -- if you have a yen for every modern convenience, this yurt would not be your accommodation choice. A wood-burning stove -- primitive but handy -- provides heat and a stove for cooking up yummy treats. Inside this structure, composed of heavy canvas on a frame, we spun yarns and played games until we yawned and yielded to sleep. We stretched out on clean, dry bunk beds. No one yelped or yammered in complaint about yet another family trip. 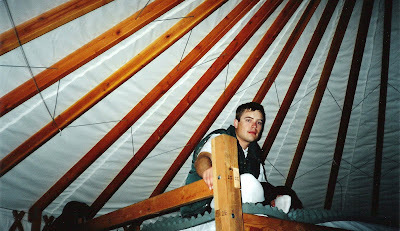 Yes, we have good memories of our cozy stay in a yurt. I love yurts! And I got to see several of them today! How fun! And it looks as if you guys did have fun! Fun post and great shots for the day, Janie! very interesting Janie--I've never heard of these things. Yurt is a great Y! And I love these family fun photos. What a fun family outing. I'm seeing yurts at KOAs and the on our National Forests. What a great way to go camping. You all look scantily clad inside the yurt. The heating must have been excellent. I've always imagined yurts to be the sole preserve of Mongolian nomads and Welsh hippies - now I know better. The question is - was it warm? It sounds like you had a great time in that yurt. Was the 'outhouse' a mini-yurt as well? Great story and one feels your "so lovely remembering" this trip! I only saw them in books or in Discovery channel shows, I even don't know the name until YOU post your Yurt story here. ^_^ Thanks for sharing! This looks so interesting!! What an adventure for your family. 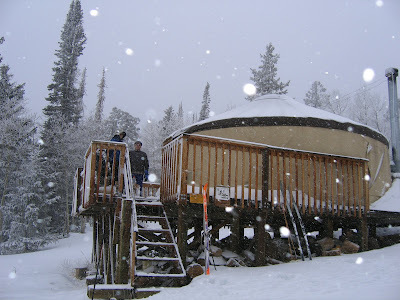 I have stayed in yurts and cabins during the winter rented from the forest service. It is always interesting especially when there is no electricity available. Great pictures. Very interesting, Janie! I've never heard of a yurt before. And I love your new header photo--it looks like a magical winter wonderland. Glad to have you back in Blogland, and congratulations on the new grandbaby! Laughing. I, too, chose yurt but unfortunately, even though I yearn, I've never had the opportunity to stay in one but it does look high on the comfort/cozy level. Great pictures! I have neighbors who vacationed in a Yurt in Northern California a couple of years ago. They had a great time and it looks like your family did too. Amazing, 3 yerts in the lst few posts. Thanks for showing us the inside of one. My son has camped in one many times in Oregon. He loved it. I hadn't even heard of a yurt before. Great "y" post! I have been tent camping in the Smokies --but that's as close to being in a yurt that I've ever been.. AND --our tent did not have any heat!!!!!! Looked like a great trip up in the mountains. That looks like a wonderful place. So cozy and lovely. I am not aware of any yurts in the Sierra. 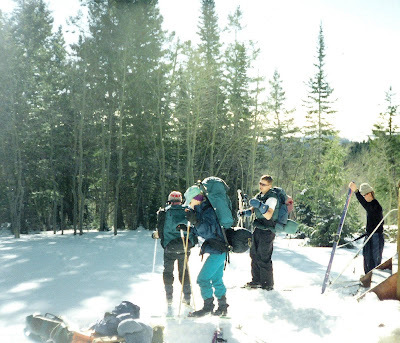 We have, a few times, skied the five miles to our cabin where we "camped out" in comfort. I could do a yurt. They have them in southeast Idaho I'm told and are in great demand. That looks like so much fun ... and warm as an igloo is cold on the outside (... or something like that). This is so cool! It's hard to imagine being warm enough though. I bet someone else asked you that already. I'm going to go have a look at your comments! I thought one could only find yurt in Mongolia , didn't know there are in the mountains of America too. I don't think I can survive the coldness there, just not used to it. I'm from a tropical island of Singapore and it's sunny all year long. What a great time you must have had. I wish I could capture the attention of my children to do such things...I just can't compete with the computers, cell phones, iPods and xBox. If I could go back to them being little we would spend less time in the hockey rink and more time doing awesome things like this. Thanks for sharing. wonderful take on the theme as usual!! 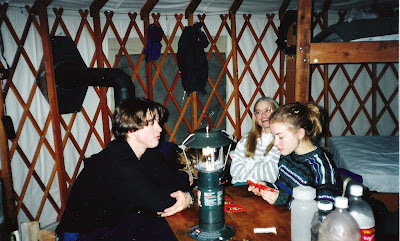 There was one summer camp in the yurt with the Girl Scouts where Denise and I tried to burn it down. That was fun! First I thought yurts are only found in Mongolia or central Asia. It seems a nice cozy place to spend the night with the whole family. Janie, that must have been a wonderful experience for the whole family to share. 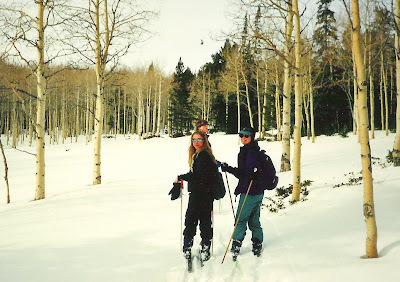 Skiing and backpacking through the snow covered mountains I'm sure has its challenges but can make wonderful memories. A lovely adventure by all of you. This is great! What fun! I bet you have great memories of that trip. Wish you a Happy New Year for you and for your's beautiful family! I love the look of them, and hanker after them a little, but no, they would NOT be to my taste to actually sleep in. I need more mod cons! That is a fancy yurt! I was just looking at the ones for rent in Algonquin Park in northern Ontario. But my husband said no, especially in the winter. They were more "on the ground" and tent-like. I almost did yurt, too, but relaized that I had done it last round with the exact same pictures I had chosen for this one. Lucky, me, I live in the YAKIMA Valley, so a replacement topic was easily at hand.. I think it would be very interesting to stay in a yurt, although I'm not sure I would want to do it in the middle of winter. Thanks for another wonderful 'ABC' post. that is actually fun Janie! Mind you, i love cooking in wooden stove. please yell out and i'll do the cooking next time.